I was a big fan of Lex Luger's growing up. When he arrived in the WWF in 1993 as the Narcissist, I welcomed him with open arms. 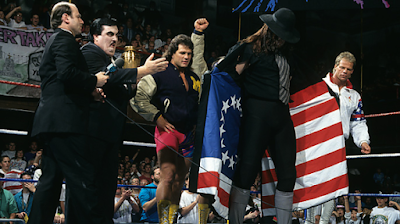 I thought the gimmick suited him perfectly, but a few months later he became a patriot in his quest for the WWF Championship, held by Yokozuna. While I don't think he pulled off the gimmick as well as he did as the Narcist, I still supported Luger. At Survivor Series 1993, he assembled a team of the company's top talent to take on a group led by Yokozuna. Both teams lost members prior to Survivor Series. The undefeated Tatanka was taken out by Ludvig Borga weeks before. Luger returned the favor and eliminated Pierre, one-half of the Quebecers from the Foreign Fanatics. The Undertaker subbed for Tatanka while Crush took over for the missing Quebecer. I would argue the All Americans will go down as one of the best teams in the history of Survivor Series. All four men achieved amazing feats in wrestling. The Undertaker's resume speaks for itself. The Steiner Brothers won multiple tag team championships. Luger, while not a huge WWF success, wore gold many times in WCW and spent months as the top contender for the WWF World Title. This show set the wheels in motion for the Undertaker to become the new number one contender as he and Yoko would do battle at the next event: The 1994 Royal Rumble. Luger ended up the sole survivor by beating Borga with the forearm of doom. 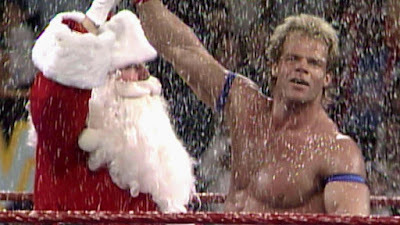 And just like Bret Hart had done a year earlier, Luger celebrated in the ring with Santa Claus after the victory.